After an awesome flight with the turbo prop machine we finally landed on Saipan and enjoyed the weather. At 16:00 we met our host, Tillman (from Couchsurfing) at Cafe Mango Six. It was my very first couchsurfing experience. Anyway he welcomed us and he showed our place for sleeping -> two couches. No problem because he already informed us before that we “just” have a couch for sleeping. His place was awesome, small but was located in the paradise. The same night we hit the beach bar at the Fiesta hotel and had an awesome first sunset on Saipan. 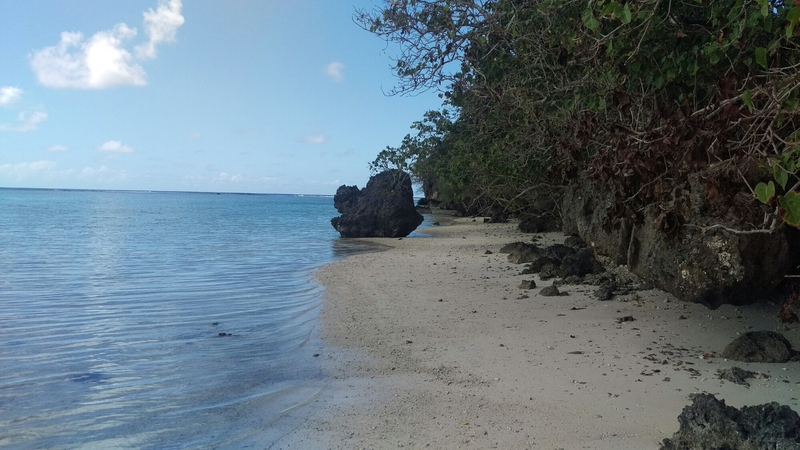 We called a day and recharged our battery for the next day: Snorkelling at the Pau Pau Beach. Then we took our snorkelling gear and swam more to the north where the reef started. For going back, we took the Middle Road from the Cave to Rte 320, the street or let’s say it was a small way is no tarmac just gravel. So, I recommend you that way back just with a 4 by 4. Due to enoguh time we also went to the Marine Beach and Tank Beach. Next day we went diving with speedy turtle. Two tanks with full gear (no computer) cost 300$, first location was Lau Lau Beach and second one was the Grotto! Please see the other article I wrote for more impressions. It was time to test our adventure skills. From our lovely host, we borrowed camping gear. Tent, air mattress and some courage. That day we went fully packed with camping gear, enough sushi for a seven-person family, enough beer, whiskey and some dessert to the micro beach where we hired a small ship for giving us a lift to Managha Island!!! Our host organized a permit for camping on the island, it takes usually two working days for getting one, price 0$. The lift to the island costs 20$ to 25$, also it depends on the time you arrive. If you arrive early you have to pay an additional entry fee on the island. If you arrive later around 15:30 or 16:00 the ticket shop is closed. We asked the people there for a boat ride the same day it think it was around afternoon 15:00. My recommendation go to the micro beach and you will see some people that offer the rides. Asked for one the same day. Thank you Tillman for that hint!!! Anyway, on the boat our adventure started, we left the boat, I gave the captain and the assistant some sip of my whiskey as a tip :). And told them that they should pick us up at 10:00 next morning!!! From then on, we were alone and nothing could help us, just we two against the nature!!! The night was horrible!!! We had to fight against outrageous crabs there were thousands of them….. That night I could barely sleep. I was happy when we left the island and we were safe again and survived that adventure. JK, I fully recommend to camp on the island! Take enough food, alcohol, water and music with you -> then you are safe ;). It was as I remember correctly the day near to Thailand New Year’s Eve therefore we went to a Thai restaurant which had at that night a delicious buffet!!!! Anyway, in the restaurant I had no chance to answer the quiz…. At that moment, I decided with my friend that we will watch Forrest Gump together back at home and also we will cook shrimp that day. Decided and done 😉 and now I can proudly tell that I have seen Forrest Gump!!! 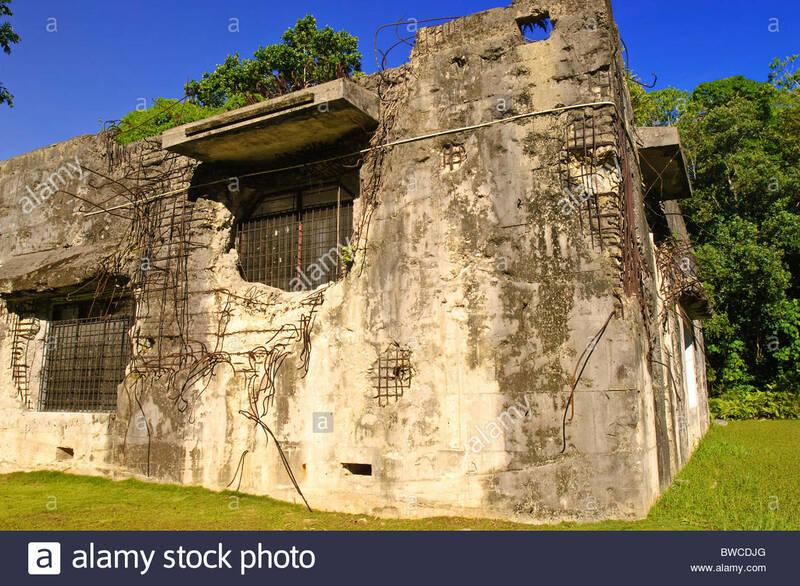 Back to my story on Saipan. The same day we have met Mike and Anna (from Couchsurfing). Together we went to Mount Tapochau to see the sunset!!!!! Awesome was also the ride on the back on the pick-up from Mike!!!! After the sunset, we headed to the Thai party / restaurant. That restaurant I also fully recommend for eating. The name was Spicy Thai Noodle Place. That night the buffet was just 10$ all you could eat. Water fight and flour fight was included due to the tradition of Thailand. I will never forget that!!! The same night we met some lovely funny Chinese people with whom we had great fun and some rounds of beer. And from then on, the travel back to Switzerland was right a head from us! 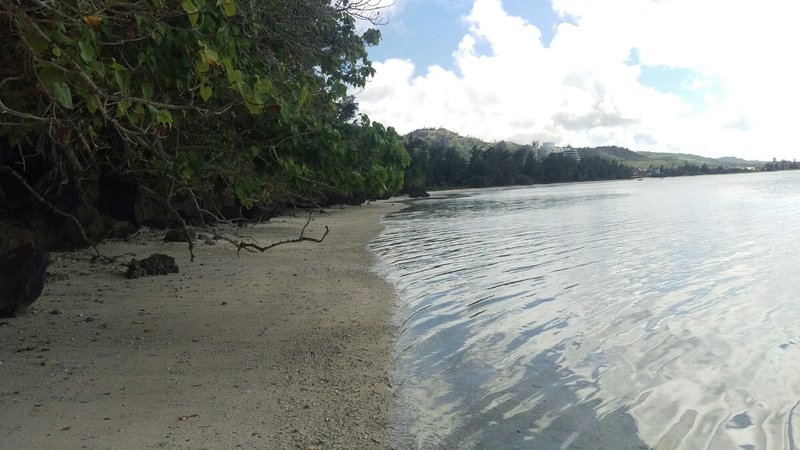 But for a lovely ending here some nice panorama from our adventure in the pacific. Four simple letters G U A M.
We finally touched soil of Guam. We went to ACE car to receive our rental car for our next days. Also that day we were really exhausted from the long travel. So we drove a little around and ate something and then we headed to our apartment, which we booked over AirBnb , where we took a small nap. That night there was a food/night market. It is every Wednesday at the chamorro village. The fire and dance show was awesome but the food was not overwhelming, it was kind of touristic but we wanted local awesome food. Anyway we headed back and my friend took a beer in pub next to our apartment… Sadly the price was 8$ for a normal size beer. After that we called it a day and hit the bed….. some hours later….. let’s say 14 hours later we finally woke up from our cryosleep. Full we energy we wanted to discover Guam. Packed our beach gear, towel, swim suit, sun scream, beer and my lovely boom box JBL charge 3!!! What a fun. Later that day we wanted to experience the night life in Guam so we hit the road and walked along the strip in Guam (Pale San Vitores Rd). Rolex, Gucci, Hard Rock Cafe etc…. What I recommend is the bar next to the slingshot. There we had a pleasant conversation with the barkeeper, which also gave us some recommendations for Guam and also for Saipan. The bar was between Uncle Sim’s Ramen and the slingshot. There you should try out the hard cocktails, not a zombie there is even a harder one!!! 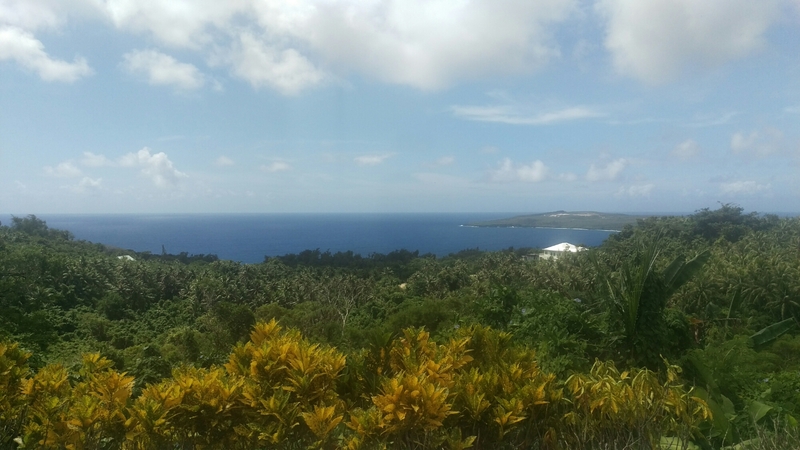 Second morning and we headed to the Guam National Wildlife Refuge….. It was close :(. Anyway there was a small little gravel road, which lead to the Coconut Beach. No people, just a beautiful beach, it is a visit worth. We drove the road until there was no way left…. Or better said a gate that blocked the way. Also worth to visit: the Marbo cave on the east side. Little walk of 5 minutes from a small “parking lot”. Take your swimsuit with you!!! Time for rum, beach and music!!! We hit the beach next to the blue lagoon condos and enjoyed the evening. Some hours later we had some additional company. That means we head good conversations and even one guy organized a kayak for us! In the middle of the night under full moon light, my friend and I tried to kayak around. We needed some attempts until we found the balance. Simply Awesome! Next day was road trip around the island. For sure we did not see everything but here a small list what we have seen. Additional note due to a hit and run we had not so much time that day :(. After these days our Guam adventure was already over and we had to head to Saipan. We had the pleassure to dive around Saipan. Our choosen dive company was speedy turtle and the price was average on Saipan. I did two dive, one at Lau Lau Beach and one in the Grotto on Saipan. My friend did two other dives near some ship wrecks. Anyway the dives were interesting and also the grey barren dive scenery at Lau Lau Beach was interesting due to the awesome rope route trough the different holes and tunnels. For me it was the perfect start after my last dives on Palau. Enjoy the pictures and the movie! The Grotto is a must for all divers on Saipan! Did I discover the paradise on Saipan? Could be, let’s look at the pictures! First we did the Chiang Kai-shek Mermorial Hall, which was huge. The soldier change at 14:00 was nice to watch. The Longshan temple was also awesome and incredicle in its architecture. After the look around in the temple we had a strol in the market, where you could eat delicous food. Unfortunately our tour was really dense packed and we had to be on time back at the airport. But still we could taste some delicious food. At that point it was already time to think about going home and go back to real life. KAYAKING was the word of the day!!! Nikko bay and the bat cave was our destination. Here some maps for you. Left one red circle is the bat cave. Also for this adventure I will let the picture speakf for them selves. We are ready for our car trip around Palau!!! But still deep down in our feelings we were afraid about the strange insurance text for the rental, what if …..
We paid already so we have to go trough it. Yeah I know first world problems. The more you have the more you can lose. Nevermind lets roll. Inside the mustang first thing was to check the stereo and set up the playlist. Did that, done that, ready to rumble. After trying out all gimmicks in the Mustang, of course even the roof has to be opened, a must! We were ready. First we went to the south south south part but sadly there was nothing special. One thing I have to mention. At this place there was a really really old building like a ruin. Nice location for a good hostel/hotel maybe one day I have enough money for investing ;). GPS re-checked, location and destination localized. Next destination was west coast (is the best coast).We drove a while and enjoyed the weather with good music. Until we reached the coast in the north west. There we have seen a funny small island in the shape of an elephant. Back in the car we headed to the waterfall in the north. We got there, and it was a short hike down into the falls after we paid the entry fee of about 10$. It was so beautiful. You could also have the chance to zipline down the hill. Unfortunately there was nobody who did that. it was amazing. My mind was so blown. There were rocks to sit on underneath the water and we just hung out (of course, had a photo shoot), and got to lie in the sun. Let the pictures speak for themselves. One the way up, back to the entry we had also a swim in the different pools which were created by the nature, was also amazing!!! So far I did not tell anything about the funny jungle monorail, from the engineering point of you it was technically simple and just awesome. Raw mechanic a really though device. The whole hike and the different place in that area was astonishing. A must visit on Palau!!! Next destination was a small war canoe from old ages but unfortunately not that spectacular…. Right know during writing this blog I found out that instead the war canoe we could have visited the lighthouse in the north with an amazing sight but yeah it is how it is. After the canoe, we drove whats called the Ring Road on the way to the Palauan capitol. It was beautiful! They views of the tropical jungles and ocean were so amazing. The capitol was incredible, too. The palace, how we called it, looked like Versailles. After that location we drove to a friend of us, where we had to deliver some goods from Switzerland. Chocolate, Elmex, gummi bears and even more good stuff. At this point I want to thank J & C for the nice hospitality and the good banana milk shake and last but not least the organization of our next day on PELILU!!! For dinner, Math persuaded me to try an Indian dish. I forgot the name of the whole dish, but also Nam was included, ohhh that was sooo delicious. Thanks Math for the idea!!! Also that night we met our friend of our diving trip from fish n fins. This professional dive photographer had some amazing equipment and he also told us some breath-taking stories. AWESOME company. Big greetings to Hawaii! At this point I am asking myself which new types of fish, flora and fauna he could add to his photo collection. I think I have to ask him!!! After the dinner we enjoyed a small party at our hotel, with DJ M with his Oboem loudspeakers. Invited was a Korean girl, a Philippine guy (Mr.. T) and we both. Oh we had a crash!! !